Saturday was just another beautiful day in Oklahoma. Mayfest was happening, street performers dancing, artisans selling their crafts. 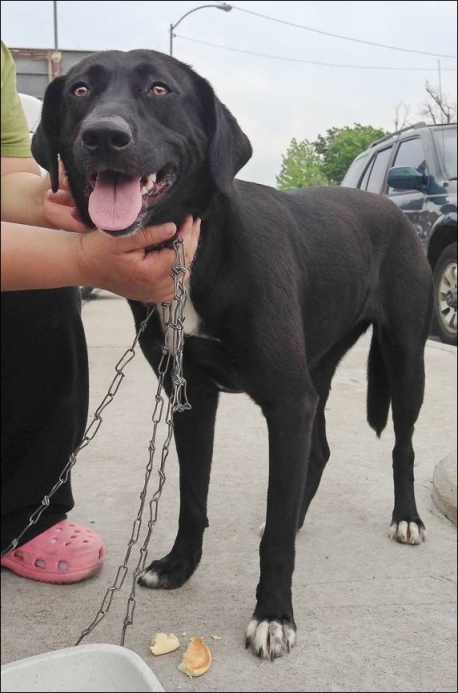 As a friend and I approached the swirling throng of people, I spied a sweet black Lab sitting on the corner, on a chain no less, with a sign stating “$50 OBO.” I bent down and stroked her head, then asked the people sitting with her why she was being sold. They told me they had no money to care for her. Pearl was her name, they said, and they wanted better for her. I looked into Pearl’s eyes and saw a gentleness. Knowing she deserved better, as her owners were trying to do, I snapped a quick photo and sent it to my friend, Dr. Sarah Gordon with 4 the Animals Veterinary Clinic. Dr. Sarah has saved hundreds of dogs and cats and if anyone could help me get her a home, Dr. Sarah could. Seconds later, a response arrived. Dr. Sarah could get her on transport. I gave the owners $50 and they gave me Pearl. As the man said goodbye, he broke down. It was all I could do to not cry with him. I had to take my friend home, so I could return to Bartlesville with Pearl. Here’s where things go wonky. We pulled into the parking lot and inadvertently, my friend opened the car door too soon, letting Pearl get out before I had a chance to leash her! As Pearl bolted from the car, I gave chase! Since Pearl and I had only been acquainted no more than 15 minutes, she wasn’t inclined to come back to the person who had taken her away from her family. I ran until I could run no more, then returned to my car. Another kind woman jumped in her car and tried to help catch Pearl, to no avail. Now, mind you, Pearl was in one of the worst places she could possibly be for traffic, around the intersection of I-44 and Skelly Drive. I was terrified Pearl would be hit and killed. With this thought pressing on my mind, I drove and drove, but couldn’t find her. A call to AAA and two-and-a-half hours later, I’m back in Bartlesville. In the meantime, I’ve posted on Facebook about losing Pearl. Other friends post on CraigsList for me. Rescuers and people I don’t even personally know mobilized, trying to find her. I’m sick with worry and can’t sleep. Two in the morning and I’m wide awake, checking Facebook. A wonderful couple post they’re going out to look for Pearl. At 2 a.m.! Can you believe that?! I cried myself to sleep for the kindness of strangers and prayed for Pearl’s recovery. Sunday we mobilized. “Lost Dog” fliers in hand, business cards to give out, we join forces. A small army of pet lovers go out at various times looking for her. We concentrated our search around where she was lost given we’d had several “sightings” from various people. 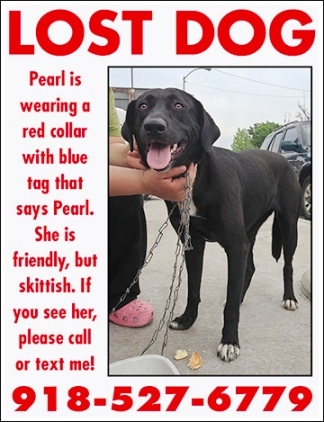 Unbeknownst to us, there was another black Lab fitting Pearl’s description lost in the area as well. From 9 a.m. until 6 p.m. we searched. Nothing. No one had seen her. Disheartened, I decided to call it a day. On my way home, I received a message. Someone had seen a dead dog on I-44 matching Pearl’s description. My heart sank. I turned around and drove back to Tulsa. Others head that way, too. All of us drive that stretch of interstate at least twice, but no dead dog. Relief floods my soul. I decide to look until I’ve completely lost daylight, then returned home, again brokenhearted. I’m sad for Pearl and afraid for her safety with the coming storms. Monday we mobilize, more fliers in hand. Dedicated volunteers come out at various times, looking for her, but again, nothing. I keep one eye peeled to the sky, the other looking for Pearl. Severe weather is approaching and people are texting me to not go home because of potential tornadoes in my path. Knowing my girls are there, I head home anyways. At 5:34 p.m., minutes after I pull into Bartlesville, I receive a call from a sweet little lady telling me she’s seen Pearl! I could tell by her voice she was quite elderly. She informed me she saw Pearl’s “lost” poster on her Facebook feed. Go Granny! According to Granny, Pearl was around half a mile southwest from where we had concentrated our search, so no one would have seen our “lost” fliers! Thank God for social media! I text several people in Tulsa, telling them her current location, and they once again mobilize for Pearl! All in the midst of severe weather! At 6:06 p.m., I receive a phone call from Melody Parkins. She found Pearl! I’m so excited, I’m jumping around the house yelling, “You’re kidding?! Oh, my God! Thank you, Jesus!” My dogs are looking at me like I’m nuts. 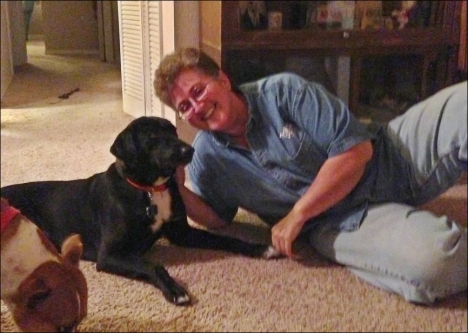 🙂 Melody and her husband, Kent, were the two who went out at 2 a.m. searching for Pearl. Then Melody tells me a little more. The gentleman who found her likes her so much, he wants to adopt Pearl. My heart soars! I tell Melody I’ll be there in an hour, so off to Tulsa I go again! Storms be damned! I was so happy, I almost burst into tears. As a diligent adopter, I grilled Ward a bit. A teacher and coach at Booker T. Washington school, he answered all my questions with complete honesty. A few more questions and I knew: Ward was the one. We did a handshake agreement Pearl would come back to me if anything didn’t work out, and Ward burst into the biggest smile you could imagine! He hugged Pearl, then she was off to play with Sadie like they were old pals. Y’all know me. I can’t go anywhere without snapping a few (hundred) photos, so I pulled out my iPhone and snapped a few of Pearl and her new family. She sat by Ward, paws up on his leg, like she had always been. Flipping over, she pawed at him to scratch her belly. Then she turned and smiled at the camera like, “See? Sometimes the best laid plans of mice and men just have to be rewritten by the dog!” I smiled back at her and knew Pearl was finally home. It may have been a roundabout way to get there, but she was where she belonged. If we had found Pearl before Ward did, they would have never met. Pearl would have been out of state awaiting an adopter, and Sadie wouldn’t have a sister. Things happened as they were supposed to. Pearl was safe and no longer alone. There’s no way any of this would have happened if it hadn’t been for the diligent volunteers, who went out in all kinds of weather searching for Pearl, and the wonderful social media networkers who posted and crossposted Pearl’s photo hundreds of times. Please forgive me if I forget anyone, but I want to personally thank Melody and Kent Parkins, Sheryl Bailey, Reneé Baldwin, Dawn Chase, Reneé Collier, Karel Bagwell, Anu K., Kris Allison, Mary Taylor, Kim Hopkins, Norman Cole, Merri Beth Rasor, Cailyn Gustafson, Mindy Iness, Sally Collins, Ashley Sweeney, and Granny from Facebook. You have my undying gratitude and respect. You have no idea how much it means to me knowing people, some who were complete strangers in the beginning, braved severe weather and spent days looking for someone else’s dog.